These are the adjectives that help explain why Jannick Rolland is the 2017 recipient of the Edmund A. Hajim Outstanding Faculty Award. Rolland, the Brian J. Thompson Professor of Optical Engineering, joined the Institute of Optics in 2009. • Helped shape the Robert E. Hopkins Center for Optical Engineering, which she has directed since 2012. It is now a shared instrumentation facility that promotes collaboration across departments, and recruits diverse undergraduates from optics and mechanical and chemical engineering into its research. • Spearheaded the 2013 creation of the Center for Freeform Optics (CeFO), which she directs and which now has 16 corporate and research laboratory members. CeFO, a joint venture with UNC-Charlotte, brings the universities and companies together at the precompetitive research stage of a game-changing new technology. Freeform optics uses lenses and mirrors in a range of shapes to deliver increasingly compact, lightweight and easily targetable optical devices. • Co-founded and is CTO of LighTopTech, which she launched in 2013 with Cristina Canavesi, based on high definition volumetric microscopy Canavesi helped develop in the Rolland lab. A liquid lens refocuses at different depths inside samples to obtain high-resolution volumetric images of materials. This allows medical professionals to rapidly and noninvasively image subcellular structures beneath the surface of the skin or within the human eye. It can also capture details inside materials to monitor the quality of manufacturing processes. 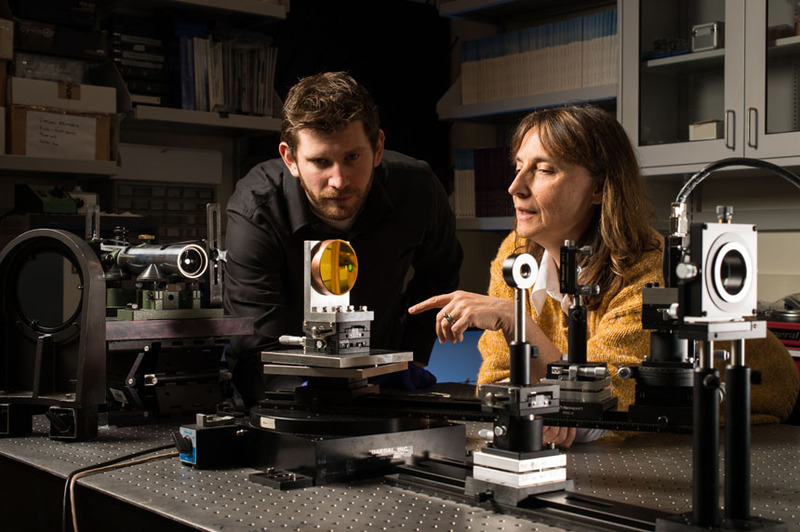 • “Produced some of the very best students,” says Xi-Cheng Zhang, director of the Institute of Optics and M. Parker Givens Professor of Optics. For example, Kyle Fuerschbach, one of her graduate students, was awarded the 2014 outstanding dissertation award in the Hajim School for pioneering work in freeform optics. “The Hajim Outstanding Faculty Award is a perfect recognition for Prof. Rolland’s contributions,” Zhang says. Rolland already had a distinguished track record in research and education when she came to Rochester. Recipient of a PhD in optics from the University of Arizona in 1990, Rolland served as a research assistant professor in the computer science department at UNC-Chapel Hill from 1992-1996. She then served as professor of optics at the University of Central Florida from 1996 to 2008, helping establish the Optical Diagnostics and Applications Laboratory at CREOL (Center for Research and Education in Optics and Lasers). She is a fellow and a director of the board of the Optical Society (OSA), a fellow of SPIE, and a senior member of IEEE. She was awarded the 2014 David Richardson Medal of the Optical Society for visionary contributions and leadership in optical design and engineering, enabling noninvasive, optical biopsy. Reimers joined Rolland’s group just as the Center for Freeform Optics was taking shape, and worked on one of the center’s first projects. He’s had an opportunity to meet and work with representatives from 20 to 25 companies; he’s been giving talks since his second year with the group. “I feel like I’ve had so many advantages, just from being associated with Prof. Rolland,” he says.